This week’s episode, penned by Adam Glass, in many ways felt like a throw back to the Supernatural of old. The boys together on a hunt, framed around a returning character whose story reflects what is going on with the brothers, both past and present. Add some emotional broments in the Impala and a monster of the week who has some deeper connections to the plot and we have the potential of something great. This particular monster from the past turns out to be werewolf Kate (Brit Sheridan), whom we first met in Robbie Thompson’s somewhat unconventional episode Bitten (8.04). I have to add that I liked Bitten. I found it an interesting experiment in seeing a Winchester hunt from the point of view of the hunted. The first person semi-documentary style camera work in that episode suited the characters and their young portrayers well. Since Kate was one of the few monsters Sam and Dean have let escape, there was certainly some story yet to explore. The boys meet back up with Kate when they get wind of several werewolf style attacks in a small Washington town, and they suspect she may be to blame. It turns out however, to be her younger sister who is behind the sudden bloody deaths. Kate had turned Tasha (Emily Tennant) into a werewolf in order to save her from certain death after a car accident, but was unable to persuade her to stay on the non-people eating path along with her. In the end, Tasha was too far gone to be saved and Kate had no choice but to kill her sister. Putting the continued liberties with previously established werewolf lore aside, the parallels presented between the story of the sisters and the Winchester brothers, were both too obvious and strangely clumsy. Even Sam admitted that it was not fair to put their stories at each other’s feet. From seeing Tasha lying in a hospital bed and Kate making a questionable decision to save her life, to the fact that Kate ends up not being able to save her sister from the dark side and killing her; the anvils were dropping like werewolves in this episode. Certainly to be treasured; for the first time in what feels like forever, we get many moments of actual conversation between the Winchester boys. 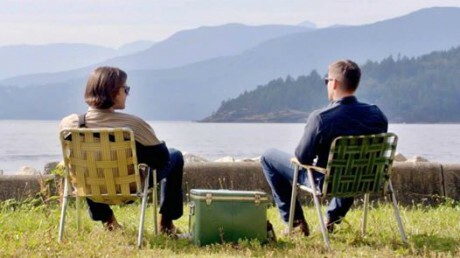 In fact the episode opens with Sam and Dean by a lake, sharing a beer under a “no hunting” sign, their ubiquitous green cooler between them. It seems that they took Cas’ advice and are taking some “we” time, as Dean puts it. It sure looks like they are relaxed, a fact that is belied by the worried look in their eyes, which is revealed when they remove their sunglasses. Dean wants to get back to hunting, but Sam is concerned he is not ready. It is significant that Dean lets Sam take the lead here. He promises to tell him if things start feeling out of control and all through the episode it feels like he means it. Dean is in a talking mood and every time they have a moment to themselves, the boys actually share their feelings. I have to say that Jared Padalecki and Jensen Ackles make the most of these moments and its great to watch. It is a testament to how well they know these characters and their relationship, because even when the dialogue of some of these scenes is muddled, the intention is clear. The point of the words they say in relation to the continuing story is a little less obvious. It almost seems like one conversation is fighting the other. All in all, although I enjoyed many parts of Paper Moon, it did not quite add up to its potential for me. Great to have an old fashioned hunt; too bad that the huntees were not so impressive. Where the deliberately amateurish filming style of Bitten suited the young actors at the time, I felt that they didn’t quite measure up under the weight of a much more traditional challenge. Great to have the MotW be a recurring character with actual history with the boys; too bad that their parallel stories were so obvious and lacked nuance. Amazing to have so many brother scenes, with actual talking no less; too bad that the writing of some of that dialogue was so clumsy. Even though the expository flashback scenes were too long, the episode’s pacing did fare better without the interruption of the other plots of the season. The best part by far for me, was the easy banter and brotherly teasing we all have missed so dearly. How wonderful to see them honest with each other and share their feelings and fears, as well as some jokes. They are of course not at all out of the woods. The Mark of Cain looms over them both and Dean’s warning to Kate that her sister was in too deep and that there is no coming back from that, is a chilling reminder of just how much trouble they are still in. Yet, this is the first time in two seasons that it feels natural to have the boys go off together to attend to the Winchester family business of saving people and hunting things. Sam and Dean are not only where they belong, but where they both want to be, and that is glorious. We have to wait two whole weeks for the 200th episode, Fan Fiction. While we wait, what are your thoughts on this week’s episode and what do you expect from the next? I would love to hear your thoughts in a comment below.